Hi Everyone! Justin and myself (Joannie) from the Hymn Remix Project will be doing a workshop featuring a paired down set of Hymn Remix arrangements on Wed. July 19, 3pm, as one of the sectionals in the conference. Our hope and prayer is to encourage and inspire other worship leaders in modern church settings, and introduce our arrangements to them for use in their own worship services. The Hymn Society (of the United States and Canada) was founded in 1922, and organizes annual conferences with workshops, plenaries, and hymn festivals as connection points to encourage, promote, and enliven congregational singing. This is a wonderful opportunity to dialogue and network with other worship leaders and church music ministers to share songs, hymns and new worship resource materials. The Hymn Remix Project is super excited to be part of this conference opportunity in Waterloo this year, and invite you to join us as we encourage, promote and enliven congregational singing with modern hymn arrangements. 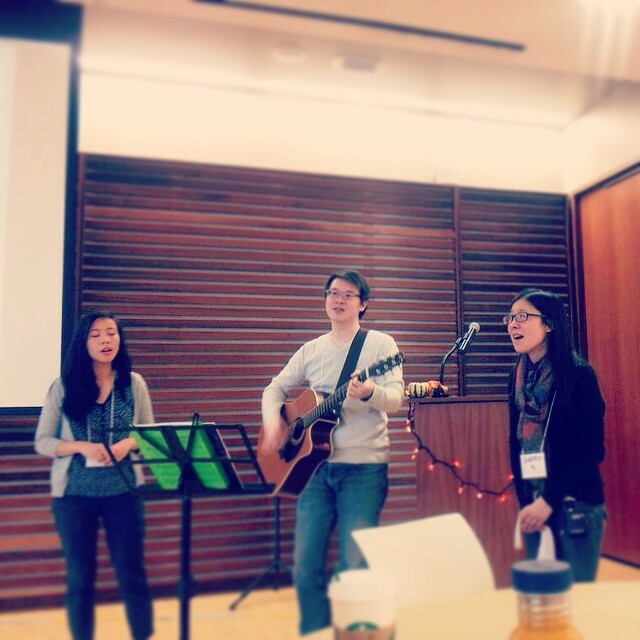 In late October this year, I had the awesome opportunity to present my paper “The Hymn Remix Project: a Modern Music for a Modern Church Generation” at the Elements Experiment Conference, a multi-faith forum for discussion and dialogue on anything related to religion, the secular, and public spaces. It was an interesting day of insightful presentations, with topics that included, among other things, the struggles of indigenous youth and spirituality; a day in the life of those living in the Christian community at L’Arche in Greater Vancouver; and the spiritual dimensions of cherishing nature and a passionate plea toward environmentalism — clearly a wide and interesting array of subjects! ­­This was followed by friendly round table discussions. This was a paper I had written in early 2012 while we were still envisioning and planning the album. At the time, my professor at York University made numerous suggestions, and I had always vowed to do major revisions; but alas, over two years passed and nothing happened on my part! When I found out about the Elements Experiment Conference through a good friend, I immediately embraced the opportunity not only to work toward a hard deadline but also to challenge myself to share the story of Hymn Remix amongst a group of multi-faith people in a meaningful manner. For the keeners, you can download a full copy of the paper here. I explore the connection between music and spirituality, then brief through the historical context for Christian hymnody. Thirteenth-century philosopher Thomas Aquinas once wrote that, “A hymn is the praise of God with song; a song is the exultation of the mind dwelling on eternal things, bursting forth in the voice” (Aquinas trans. 2007). The hymn as a song form is prominently attributed to the Reformation, where congregational hymn-singing became popularized by Martin Luther and Protestant churches. One reason was that many hymns were being sung in the German vernacular, compared to liturgical worship of the high church sung by skilled choirs in Latin. Hymns, then, became the song and the voice of the common people praising the Lord: this was an important historical shift in the evolution worship music. The paper continues with discussing the influences of modern society and the changing musical influences on today’s diverse church congregation. According to Statistics Canada, more than half of Canadians age 15-29 either have no religion or have never attended a worship service; furthermore, only 22 per cent say religion is important to them, down from 34 per cent in 2002 (Valpy 2010). It is no secret that interest in organized worship services amongst the youth is dwindling, and one cannot help but wonder if the style of worship music presented could have an impact on that. In response to this, I feel that initiatives such as the Hymn Remix Project fill an important niche in the Christian contemporary worship music genre. It certainly is not a unique idea, and others have done similar projects, including Halifax-based worship pastor Tim Milner, with an album of Epic Hymns in both an acoustic and rock version. Similar to Milner’s rock version, the Hymn Remix Project uses the instrumentation and style of modern popular music (electric guitar, drums, keyboard, bass) combined with the lyrics and melodies of the timeless hymns; in doing so, we can preserve a rich theology and tradition of hymnody that the older generations identify with while still appealing to a youthful demographic. For myself, a large part of the heart behind such a project is to see unity in worship within a diverse church congregation — both among the young and old. At the Elements Experiment Conference, I had the pleasure of having Justin and Heidi present with me. As a trio, we did a live music demonstration. We sang through one verse of the traditional version of “May the Mind of Christ My Saviour” in 3-part a cappella, then did a live acoustic version of the Hymn Remix Project’s arrangement of “May the Mind of Christ.” It was a neat comparison for all who were present to hear and discuss the different arrangements: the traditional one had a straight melody with quarter notes, while the Hymn Remix version had the added chorus, a less rigid melody, and simplified harmonies. All in all, the Elements Experiment Conference not only a great opportunity for me to share about the Hymn Remix Project to a multi-faith group, but also to reflect on the historical context of hymns, the Christian contemporary worship music we have today, and the heart behind the Hymn Remix Project in its potential to bring unity in church worship to a modern and diverse church population. Aquinas, Thomas. “St. Thomas’s Introduction to his Exposition of the Psalms.” The Aquinas Translation Project. Trans. Hugh McDonald. 2007. Accessed Sept. 18, 2012. http://www4.desales.edu/~philtheo/loughlin/ATP/Proemium.html.